In the early 1980s, my brother and I would make an annual round-trip between Keyport, New Jersey, and Newport, Rhode Island, aboard his 24-foot Pearson Lark sloop Froetjers. Whether we were coming or going, we would always “go inside”—meaning inside Long Island, via the East River. 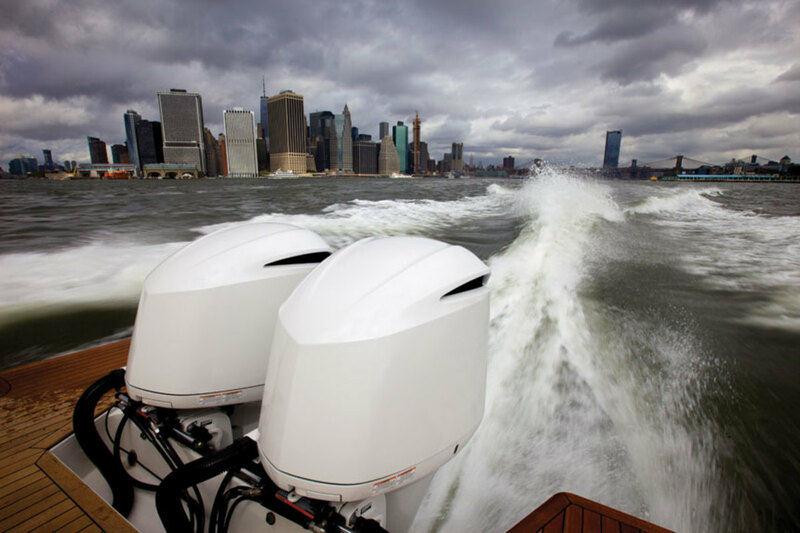 Navigating Manhattan with twin 300-hp Yamahas is a breeze. Going outside would have meant an overnight sail into the Atlantic. While that appealed to my brother, our father put the kibosh on it. A former merchant mariner, he was concerned that an oceangoing ship wouldn’t see our cheap radar reflector and run us over. So, we’d run inside and consume the better part of daylight—12 hours or more—getting the Lark from one side of New York City to the other. We’d always pore over the Eldridge Tide and Pilot Book to work out our departure time, because the tidal current in the East River could run 5 knots. If we caught a foul tide, the Lark’s 5 knots of speed—courtesy of a 9.9-hp Chrysler Marine outboard—could turn our ground speed to zero. Today, running from Long Island Sound to Raritan Bay still involves careful planning, but as I’m discovering on the Back Cove 34O, it won’t take a whole day. We’re en route to Sea Bright, New Jersey, on a delivery run from Glen Cove, New York. It’s cloudy and the water is a bit confused, but with the Back Cove 34O moving at 30-plus knots, the shoreline is passing like a blur. This Back Cove is that quick. Until now, Back Cove built only single-engine inboard boats. 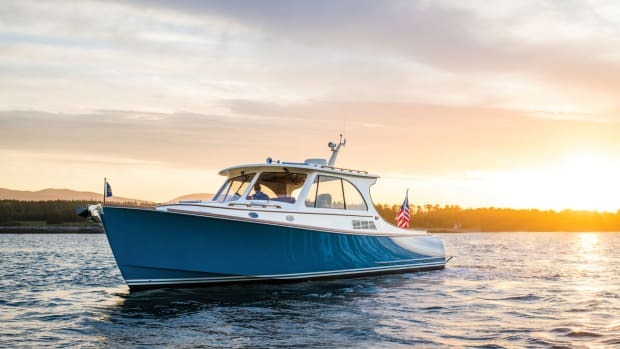 The 34O (the O stands for outboard) is its first outboard-powered model, and it’s the company’s fastest boat yet. 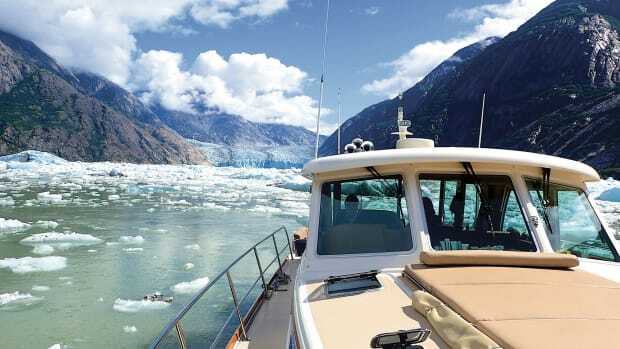 The 34O we’re delivering has twin 300-hp Yamahas that provide a 30-knot cruise and a top speed of 37 knots. 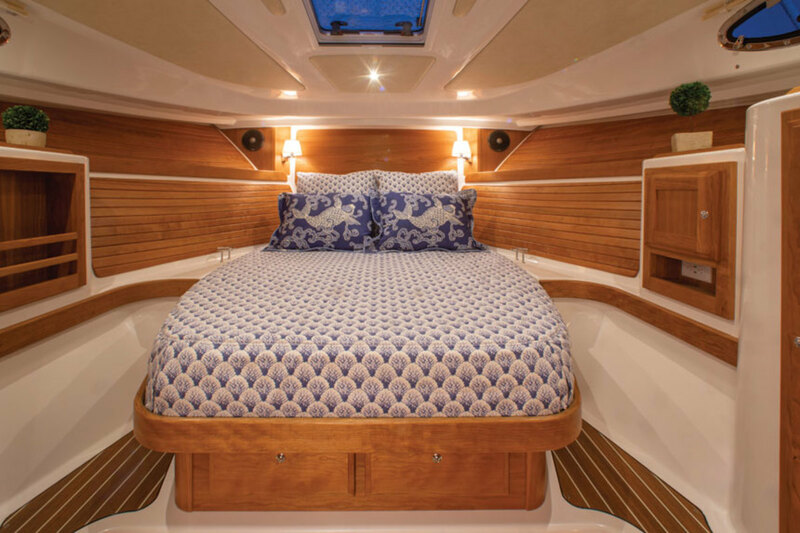 With optional Suzuki 350s, this 34O can achieve 40 knots, according to the builder. That’s a big boost from the 29-knot, top-end speed of an inboard-powered Back Cove. Our cruise begins at DiMillo’s Yacht Sales in Glen Cove, on Long Island’s North Shore. 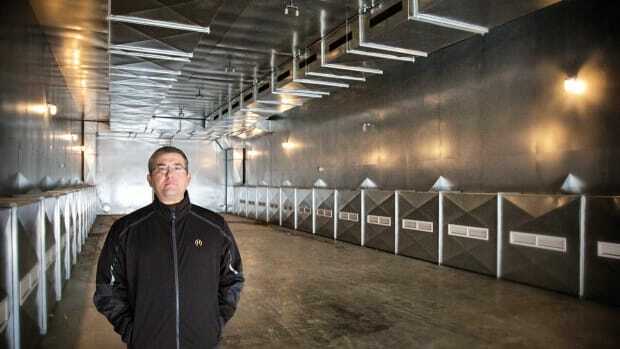 (I drove there by car with Kevin Gallina and Drew Bergin of Sandy Hook Yacht Sales in Sea Bright.) After a quick orientation, we leave just before noon. There are 1- to 2-foot waves outside the harbor as we take the shark-colored 34O up to 34 knots. Even at that speed, she is quiet and comfortable. With Gallina at the helm, Bergin hangs out in the pilothouse while I take photos. The twin Yamahas hum, making it easy for us to have a conversation. I’ve always liked the throb of an inboard engine, but the sound of the outboards at high speed is not unpleasant. 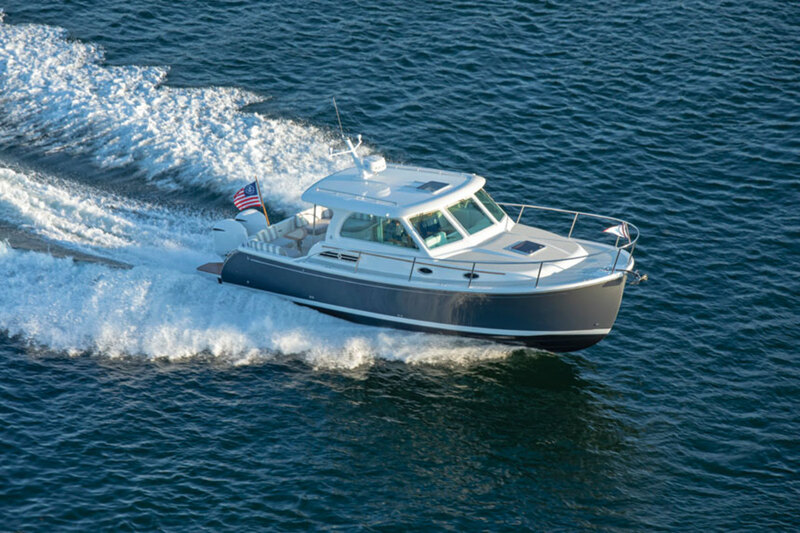 The 34O has a single-level deck that extends from the transom forward to the helm. 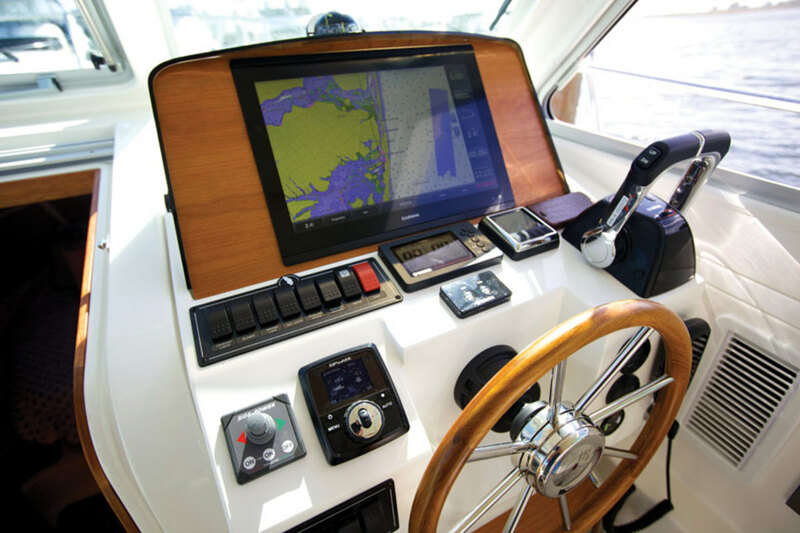 Where an inboard engine would ordinarily reside, there’s stowage beneath the sole for fishing rods and other gear. Also on the helm deck are a galley and a U-shaped settee that converts from a dinette to an aft-facing seat. In the cockpit, a transom door leads to the swim platform that wraps around the twin engines and provides enough room for crew to access the dock or the water. The 34O can be used as a day-tripper or for weekends aboard. 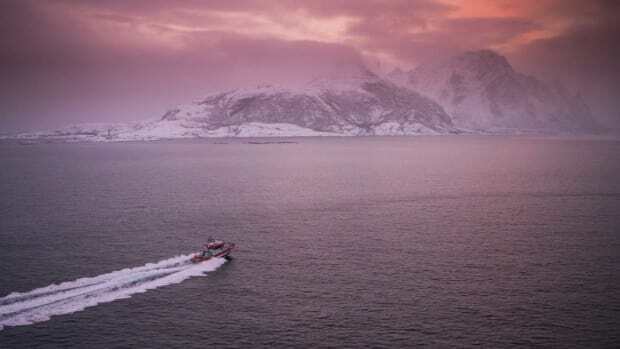 In the cabin is an island berth for two, a head to port and a shower to starboard. 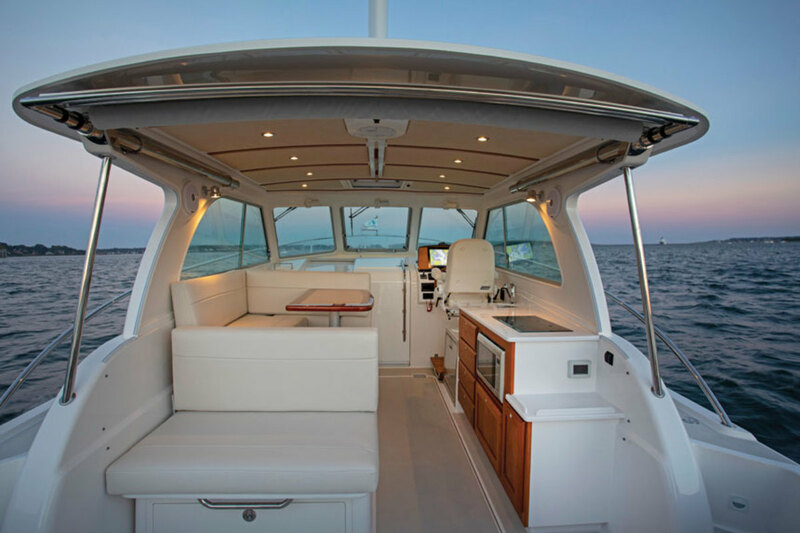 The 34O has a single-level deck, an island berth and helm with optional 17-inch screen. Gallina, Bergin and I stop in the middle of Long Island Sound to put the hull to the test. From a dead stop, with a full load, the 34O hits 37 knots in 17 seconds. (Back Cove says the 34O gets on plane in 4.5 seconds and powers up to 26 knots in 9.8 seconds). We slow to 29 knots as City Island appears to starboard and the U.S. Merchant Marine Academy at Kings Point comes into view to port. The water is getting lumpy, but 25 minutes after leaving Glen Cove, we pass beneath the Throgs Neck Bridge. Hell Gate is next. Located just east of Manhattan, Hell Gate is where the Atlantic Ocean, Long Island Sound and the Harlem River collide. The Dutch named Hell Gate in the 1600s; they called it Hellegat (Hell’s Hole). By the 1850s, it would sink an average of 50 ships per year and ground about a thousand of them. Its whirlpools were so treacherous that the U.S. Army Corps of Engineers spent 70 years trying to tame the place. In 1885, in an effort to remove an obstacle called Flood Rock, the corps detonated what was until then the largest explosion known to man. The blast was felt as far away as Princeton, New Jersey. 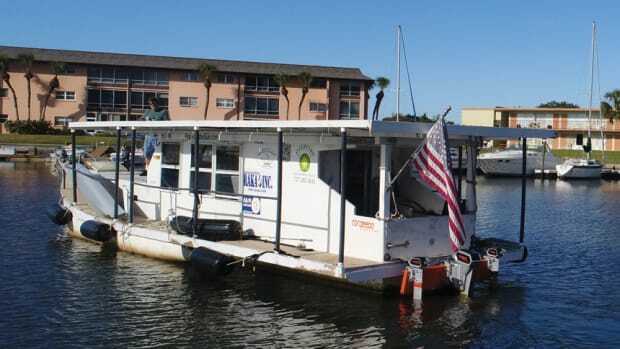 When my brother and I used to cruise here, we were aware of the area’s proclivity for wreaking havoc with small boats. We once arrived at Hell Gate just as it began to fester, and the whirlpools sharply jerked our bow from port to starboard and back again. We did not enjoy it. As the Back Cove enters Hell Gate, conditions are unnoteworthy. By complete chance, our arrival coincides with peak high tide and we blow through at high speed. At the Upper East Side, we cross paths with Justice, a 75-foot Consolidated Shipbuilding motoryacht built in 1930 that throws us a large wake. The 34O pops over it, unfazed. Gallina opts to pass east of Roosevelt Island where traffic is usually lighter and the water calmer, but because of activities at the United Nations, the other boats also pass behind the island. He reduces speed for a sailboat, but everyone’s wakes rebound off the steel bulkheads on both sides of the narrow channel, creating a nasty crosshatch pattern. 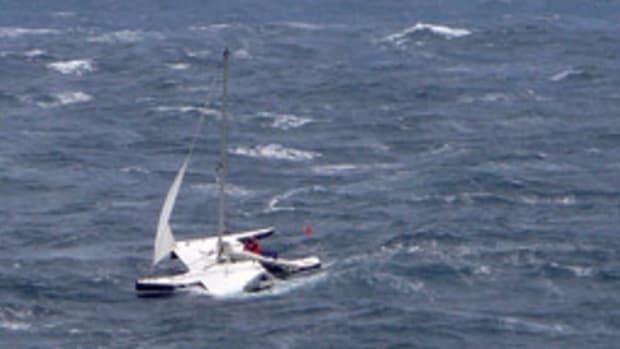 The southbound 40-footer gets tossed around, and I empathize with its occupants. 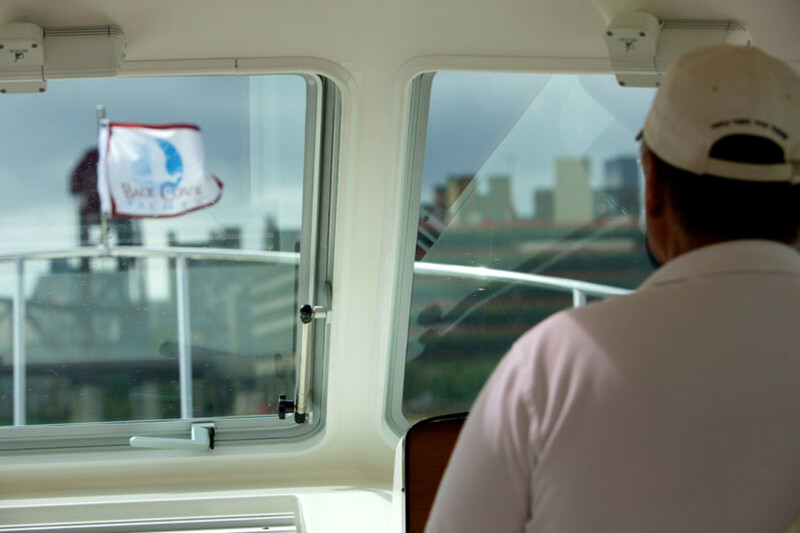 As the United Nations building appears from behind Roosevelt Island, we take the 34O back up to 25 knots and pass beneath the Williamsburg and Manhattan bridges. We take in the view of Lower Manhattan. Even on an overcast day with clouds rolling overhead, this skyline never fails to impress, especially from the water. Gallina slows the boat so I can take photos as we pass beneath the Brooklyn Bridge. Then it’s back to high speed as we put Governor’s Island to starboard. The Statue of Liberty appears in the distance, and at 30-plus knots, Lower Manhattan rapidly shrinks from view. The East River provides plenty of urban scenery. We zip beneath the Verrazano-Narrows Bridge. The ocean is gently rolling in from the southeast, and although we could maintain this speed, Gallina takes us down to 19 knots. 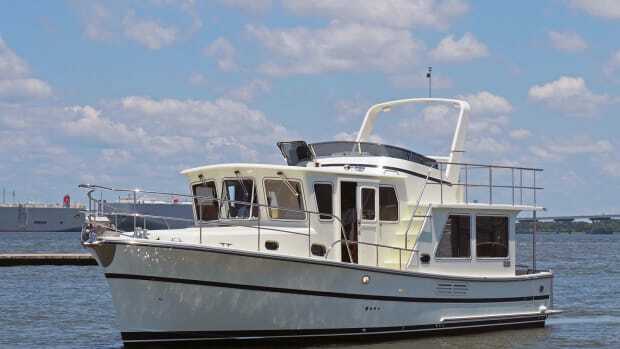 The Back Cove has no trouble as I steer her across Raritan Bay, and when we get behind Sandy Hook, I take her for a high-speed 360. She cuts across her own wake without a peep. We enter the Shrewsbury River, pass beneath the Highlands Bridge and, at 2:15 p.m., with Gallina using the bowthruster to line us up, back into a narrow slip at Sandy Hook Yacht Sales. Our total time on the water was less than two and a half hours. It had taken us that long to drive from Sea Bright to Glen Cove earlier in the day by land. 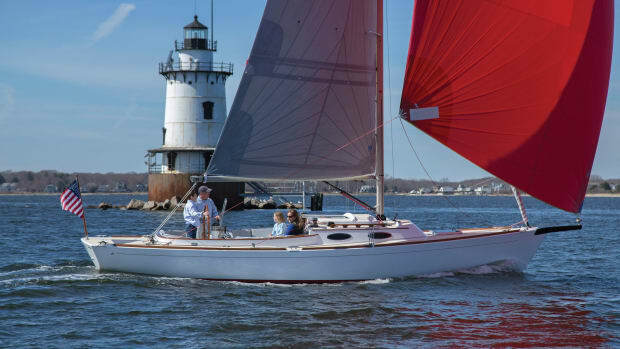 Time seems in short supply for many of us these days, which is why daysailers and weekenders are a great choice for maximizing your time on the water.